VRCBVI accepts applications or requests for services from the Virginia Department for the Blind and Vision Impaired (DBVI) field counselors and rehabilitation teachers. The DBVI initiates services by submitting an application on behalf of the student to the VRCBVI. Along with the application, the counselor/teacher must also provide current eye and medical reports (dated within a year of the application date), as well as any other pertinent information. Typically, prospective students will be notified whether they have been accepted within one month, unless there are extenuating medical circumstances which require clarification to assist us in best meeting the needs of the student. Once the application has been received and the student has been accepted, the VRCBVI Director will work with the student to schedule an entry date. A pre-entrance conference call will be scheduled between the prospective student, his or her field counselor/rehabilitation teacher, and the case manager at VRCBVI to discuss Center expectations and to answer any questions the prospective student may have. DBVI counselors/ teachers are encouraged to arrange a tour and personal interview for individuals and their families prior to applying for VRCBVI services. On-site tours and visits are welcomed, and a representative is available to visit by phone with prospective students, their families, and agency personnel. To schedule a tour, please call our Director Melody Roane at (804) 371-3323. During the first complete date of services, we provide each student with a comprehensive orientation to our facilities and program, introductions to staff, information about his or her class schedule, and advice regarding our policies and guidelines. Initially, students participate in an evaluation process to determine existing skill levels in all course areas and goals for those classes. VI provides residential orientation and adjustment training to blind and vision impaired adults. We also offer services to commuter students who return to their homes in the evenings and on weekends. Students generally remain in training from six to nine months depending upon individual needs; however, this can be modified according to individual student goals and needs. 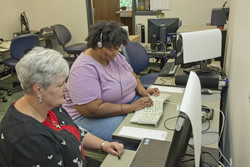 The full training curriculum includes orientation and mobility, personal and home management, braille, keyboarding and access technology, academic instruction (GED) (if needed), conversations about blindness, vocational services, health education, wellness instruction and recreation, case management services, low vision services, and dormitory services. All classes emphasize the development of self-confidence and promote a positive attitude about blindness. On average, the Center serves approximately 25-35 students in the general program. During training, most students live in the dormitory located on VRCBVI’s campus. We have private dorm rooms with shared en suite bathrooms, and independent living apartments. The VRCBVI cafeteria provides breakfast, lunch, and dinner seven days a week to residential students who are in training at VRCBVI. Upon request, special dietary and nutritional needs will be accommodated, to the extent practical. Are you afraid to walk somewhere you might encounter stairs? When you want to go someplace, do you have to wait until it’s convenient for a friend or relative to help you get there? Do you avoid crowded places? Do you often hear people say to you, “Look where you’re going?” If your life experiences seem to be shrinking because you feel more comfortable staying at home, orientation and mobility training can help you gain or re-gain the freedom and fun in your life! We will teach you different ways to gather information about your surroundings without needing to use vision. Upon completion of our program, students are able to go where they want, when they want, safely and independently. An astonishing number of people who are legally blind choose to hide their vision loss. They present themselves as sighted due to the negative public perception that is associated with blindness. 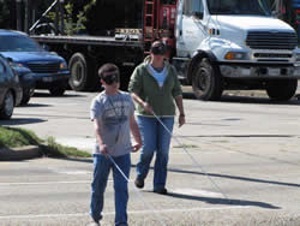 Most people who pretend to have good vision have not been exposed to proper training in the use of non-visual skills; a large percentage grow to love using the long white cane and non-visual travel techniques once they experience the freedom that comes with using these tools. Is it a challenge for you to sort your clothes and do your own laundry? Have you ever wondered how you could manage your own money and independently grocery shop for yourself and your family? Do you ask yourself how you could label items in your kitchen pantry so you can find what you need quickly and efficiently? Is your vision making it impossible for you to get and stay organized, and keep your house clean and neat? Learning skills of daily living will enable you to care for yourself and your home environment independently. Our Personal and Home Management instructors teach students non-visual cleaning skills so they can keep their own homes clean and sanitary. In this department, students learn the fundamentals of personal and home management, including organizational skills, sewing, cleaning, laundry, ironing, clothing identification, alternative labeling of household items, grooming, banking, budgeting and money management, record keeping, and adaptive technology designed to assist them perform daily living skills independently. This department also provides supervision and guidance for the independent living apartment experience. Please consult the instructors in this department for further information about the independent living apartment experience. Have you ever wondered if you could prepare a Thanksgiving meal for your family and friends? Did you previously entertain friends in your home, but have now stopped due to your vision loss? Do you miss cooking your favorite recipes? Does the thought of using a deep fryer scare you? Do you want to be able to cook delicious food and present it in an appealing manner again? If “yes” is your answer to any of these questions, VRCBVI’s cooking/kitchen skills classes can help you! VRCBVI has a large kitchen classroom with three work areas. Each work area is equipped with a stove, refrigerator, dishwasher, sink, and microwave. Instruction includes cooking terms and techniques, ways to access recipes, and cooking from scratch independently and non-visually. Students learn skills such as using sharp knives safely and effectively, cooking safely around hot appliances, utilizing small electrical appliances, and cooking for a group of people. Students also learn how to clean the kitchen, as well as kitchen appliances, and how to wash dishes. While working in the kitchen, students will learn to organize and label food items and spices. The goal is for students to gain the confidence and ability to cook for themselves and others, as well as to keep their own households clean and orderly. Upon completion of the cooking class, students will prepare a graduation meal for at least 20 people. The student is responsible for independently budgeting the meal, planning the menu, grocery shopping, preparing and serving the food, and cleaning up after the meal is finished. This activity will enhance confidence and demonstrate that the student is able to problem solve and successfully and independently prepare a meal for a large group of people. After completion of this project, preparing a meal for a smaller group of people will be easy to manage and will no longer seem problematic. Do you miss being able to read for business or pleasure? Would you enjoy being able to read to your grandchildren? When you give presentations, would you like to have notes to refer to even in varying lighting situations? Would you like to be able to maintain eye contact with people while you read from your notes? If the answer to these questions is yes, then learning Braille would benefit you! A Braille screen cover allows blind or vision impaired people to use touch screen devices. Instruction in Braille at Virginia Rehabilitation Center for the Blind and Vision Impaired (VRCBVI) provides functional and foundational Braille skills in the Literary Code to adult students who are adventitiously blind and have little or no functional Braille skills, or to congenitally blind students who either have not maintained their Braille skills after their secondary education, or who were not taught or expected to use Braille skills. Though students may choose only to learn the Uncontracted Braille Code, this curriculum assumes instruction will be that of the standard BANA Braille Code, commonly called the Contracted Braille Code. Students will be strongly urged to continue their instruction throughout the duration of their training at VRCBVI, and to learn the entire Contracted Code, as signage, menus, etc., are produced in the Contracted Code. Because this course is part of the Core curriculum at VRCBVI, and because learning any non-visual skill is best done non-visually, all Braille students with any residual vision are required to wear sleep shades. By using sleep shades, students will gain mastery of their skills and become more confident. 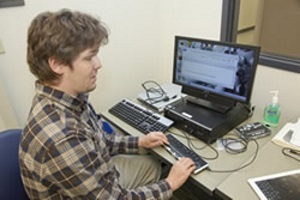 Our Keyboarding instructor ensures that students learn to touch type so they are prepared to move into our Computer and Access Technology class. Are you unable to complete computer tasks at work as quickly and efficiently as you once did? Are you unsure how to use the computer due to your declining vision? Is that computer mouse getting harder and harder to find and use? Do you ever wonder how you could use that touch screen device nonvisually? Do you wonder how technology could help you be competitive in the workplace? If so, computer and access technology training can give you that foothold and competitive edge that you need! Have you ever felt like you were the only one dealing with your particular issues related to blindness and that no one around you understood how you are feeling? Have you ever wondered how to handle a socially awkward moment involving blindness or vision impairment? What successful strategies have other blind and vision impaired people developed to find work, identify new trends, participate in community activities, etc.? Have you wondered how to handle situations in which family members or the general public took actions that demonstrated that they did not believe you could do an activity because of their perceptions of blindness? During the conversations about blindness class, these questions and many more are discussed and debated. These weekly discussion groups bring staff and students together to share common feelings and experiences, explore personal and public attitudes about blindness, and hear guest speakers who are blind share their struggles and success stories. The goals of the class are to help students develop positive attitudes about their blindness and to learn strategies to assist them to deal effectively with misconceptions about blindness encountered in the general public and in themselves. The class will also help students learn to advocate for opportunities and responsibilities to demonstrate their capabilities and talents to themselves and family and friends around them. The VRCBVI Dormitory is the residence for students who are participating in training at the Center. A dorm supervisor is on duty when classes are not being held to provide assistance to residents and to encourage use of the independent living skills the student is learning. Washers and dryers are available to residential students free of charge. Dorm supervisors are here to serve as role models for our students, and to help students deal with residential issues and encourage positive perspectives about blindness and training. However, our dorm supervisors are not counselors. Students needing information about training classes or who have training related issues arise should see the Center Case Manager, Assistant Director of Administration, Assistant Director of Instruction, or our Director. Each student is assigned a Case Manager while in training at the Center. The Case Manager provides initial orientation via a pre-conference with the student and Rehabilitation Teacher/Counselor. The Case Manager also provides individual student orientation on the first day of training at the Center. The orientation explains and clarifies student, field, and Center expectations for training, as well as program policies and components. Additional functions of the Case Manager include, but are not limited to, facilitating communication between Center staff, field staff, and the student by providing regular progress updates, scheduling and conducting evaluation, progress, and final staffings, and being available to answer questions and address training concerns brought forth by the student, Center staff, or field staff. The Case Manager assists with securing any resources or services needed for participation in Center training, and may provide supportive, individual counseling on an as needed basis. The Case Manager may also assist in coordinating community based counseling when long term mental health needs arise which must be addressed in order to promote the student’s ability to complete training successfully.